A research system that delivers analytical excellence by coupling extraordinary sensitivity, resolution and dynamic range with high-speed data collection. 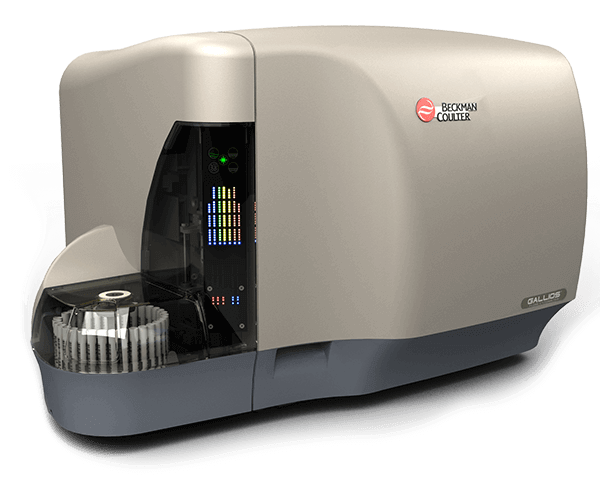 Along with the unprecedented detection capabilities of the instrument, the Gallios includes easy-to-use software and automation to facilitate superior performance of multi-color flow cytometry assays. Configuration: 10 colors, 3 lasers (488nm blue, 638nm red, 405nm violet) (5 + 3 + 2). Includes Kaluza software. Resolution 0.404 μm diameter particles. HPCV is <2% to <4% depending on the laser.